With Thanksgiving this week and winter holidays just around the corner, it may not seem like the ideal time to sell your Katy home. However, if you want or need to sell this holiday season, there are still buyers out, who also want or need to buy this time of year! 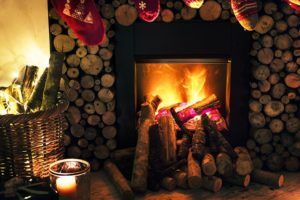 As your Katy real estate agent, allow me to fill you in on some tips that could get your home sold fast this time of year. 1. Make sure your listing is quality. Buyers are busy with family gatherings, holiday shopping, etc. They tend to spend more time house hunting online before they take the time to see a home in person. Therefore, it’s critical that your online listing has quality photos and description to lure buyer interest! 2. Use the holidays to your advantage. The holidays allow you add festive features to your home this time of year, making it look extra cozy and bright! Focus on your home’s main focal points, such as a fireplace or grand staircase. Decorate with lights and garland. Set up a tree or a front door wreath. Keep the holiday décor subtle. You don’t want to drown out the home’s features or make it look cluttered. 3. Be flexible with your time. Chances are, you have a lot going on this holiday season too. However, it’s important to keep your schedule open for last-minute showings, as buyers are busy and will need to squeeze showings into a busy holiday season. Take advantage of times that you have to leave the house by using them to holiday shop or to attend holiday events with the family. Keep your house clean at all times so it’s ready at a moment’s notice! 4. Make your home move-in ready. Buyers want a quick, easy home sale, and in a perfect world, they’d like to be settled in their new home for the holidays. Having a move-in ready home is key. Consider having it pre-inspected, so no issues cause the home sale to take longer. Make some quick updates that will impress buyers. 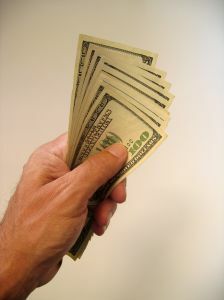 Offer incentives, such as helping pay for closing costs or including updated appliances. 5. Focus on curb appeal. As always, the outside of the home is what buyers usually see first, so take the time to spruce this up. Clean the yard and gutters, touch up paint on siding or front door, hang a decorate wreath or add a welcome mat, replace front porch light bulbs, etc. When ready to sell your Katy home, or when ready to buy in Katy, contact me! As a Katy real estate agent, I am here and ready to help you with your Katy real estate market goals year-round. When you’ve got questions, or you’re ready to get started, I’m ready to assist! Give me a call and have a Happy Thanksgiving! Move Up To Your Katy, TX Dream Home Now! If you bought a starter home years ago, now may be the ideal time for you to sell and move up to your dream home in Katy, TX. Are you ready to grow a family and need more space? Do you want to relocate to a nicer neighborhood? Do you crave more luxurious features? No matter what your reason is for wanting to move up, you’re not alone! Many Katy homeowners begin with a small starter home, and eventually move up to a bigger home when they are financially able, and when market conditions are right. As your Katy real estate agent, I am here to tell you that conditions in the Katy real estate market are ideal for move-up buyers right now! Home prices have steadily increased since 2012, so if you bought before or around then, your Katy home has probably appreciated in equity, and possibly more than you think! The average price gain in quarter two of this year was $51,000 since purchase, which is the highest average price gain and the highest average home seller return since 2007. Home prices are projected to continue increasing. While this is great news for Katy home sellers, if you want to sell so that you can move up to a more expensive home, you don’t want to wait! The longer you wait to trade up, the more you’ll be paying for your next Katy home. Experts predict that home prices will increase by another 5 percent over the next year. This means that yes, your current home value will increase, but not as much as a house valued higher than yours. Mortgage rates have remained historically low this year, with rates hovering below 4 percent. We just don’t know when rates will increase, but many housing experts are predicting an increase over the next year. The higher your interest rate, the more you’ll be paying per month on your next home. So again, the sooner you buy, the more likely it is that you’ll lock in a low rate and save yourself lots of money! As you can see, there are many great reasons to move up to your Katy dream home now. If you’re concerned about selling and buying simultaneously, I understand. It can seem overwhelming to try to sync two timelines. As a Katy real estate agent, I can help! I have experience with this and can help you sell your current Katy home while helping you find your next Katy home. Let’s work together to make your future the future you want, living in the home of your dreams. Contact me! If you are in the process of preparing your Katy, TX home for a sale this summer, you’ve most likely heard the term staging, and you’ve learned what a huge difference it can make in catching the attention of potential buyers! Staging is the process of prepping your home for buyers in a way that makes them want to buy it. As a Katy real estate agent, I am here to offer you my professional advice! Let’s talk about the kitchen, as this is one of the most popular rooms in the house, and one that buyers pay close attention to. Even if your Katy home doesn’t have a gourmet, glamorous kitchen, you could still make it look appealing to buyers with the right staging. Clear clutter. This is true for all of the rooms in your house, and it’s definitely true for the kitchen! The typical homeowner stores numerous items on the counter, such as a coffee maker, blender, knife block, bowl of fruit, toaster oven, etc. Remove everything from your counters, the top of your refrigerator and cabinets, and on your refrigerator and table, and only leave one or two appliances and a pop of color, such as an aesthetic bowl of bright green apples or lemons. Deep clean. This is true for every room of your house too, but kitchens tend to need extra attention! Don’t just wipe down the counters, scrub every last inch of your kitchen! Clean the grout, faucet, drain, inside the cabinets, inside the oven, everything, until the kitchen looks as spotless as possible. Grease can be tricky to remove, so invest in some heavy-duty cleaners if need be, or research some natural DIY cleaners that are known to work. Update lighting. Lighting your kitchen properly can make all the difference on how it appears to buyers! Let as much natural light in as you can, which not only puts your kitchen in a great light, but also shows off your windows, sliding doors and views. 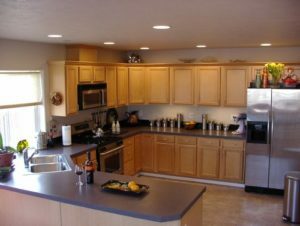 If you don’t have under-cabinet lighting, you can add some battery-powered lights for very little money. Update the fixtures over your table or cooking area for a modern look. Organize inside. When selling your Katy home, buyers look everywhere. This means that you should even consider staging inside your cabinets, pantry, refrigerator and freezer. As crazy as that may sound, buyers are trying to imagine their own lives there. If they see clutter inside these areas, they might determine that there isn’t enough storage space in your kitchen. Show off your space! Set the scene. Once your kitchen is looking spotless, clean and organized, you can set the scene with that bowl of apples or lemons we mentioned earlier. You could also set the table with colorful plates and napkins, or set a visually appealing vase of flowers on the table. Add plants to a windowsill. If you’re really feeling festive, fill the room with the aroma of baked cookies or citrus. For more kitchen staging tips, check out this Realtor.com article or contact me! As a Katy real estate agent, I would love to answer your questions and help guide you through the entire home-selling process in the Katy real estate market this summer. As a Katy homeowner, do you have home improvement plans for the New Year? Do you want to upgrade your home, but aren’t sure where to start? As your Katy real estate agent, I would like to offer you some suggestions! When you go to sell your Katy home, you want to impress as many potential buyers as you can. Therefore, if your home has certain features that Realtor.com said drag down a home’s value, you might want to consider updating them first. Match your paint colors. This is true for the exterior and interior. Most buyers don’t want to buy the only pink house in town, especially if all the others are neutral colors, so take note at how your home blends into the neighborhood. Inside, paint over a bright orange with a neutral color, so buyers can imagine their own design ideas. Have an inviting front door. When a buyer or a guest comes to visit your Katy home, the front door is one of the first features they’ll notice. 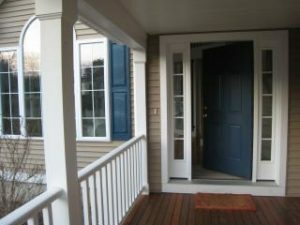 An upgraded front door is also the best upgrade for return on investment, so don’t feel bad about investing your money into an updated, sturdier option. Make sure the doorbell works while you’re at it. Update windows and screens. Buyers and guests will notice screens that look more like cat scratchers. You might be able to get away with using screen repair patches to fill in the holes, rather than replacing the whole set. Check your window frames and windows too, and make sure they all slide properly and are insulating well. Work on your landscaping. Since the exterior of your Katy home is the first thing buyers and guests see, you want them to notice quality landscaping rather than a bare yard, or landscaping that has been forgotten. Be sure to trim your trees and cut your grass. Having some fresh flowers in pots outside your front door is a nice bonus. Take note of smells. We get used to the smell of our own Katy homes, so it’d be a good idea to ask a trusted friend, family member, neighbor or Katy real estate agent if they notice any weird smells in your house. If they do, work toward finding the culprit of the odor and cleaning it in a way that will remove the smell for good. Other features that Realtor.com mentioned include eerie dripping noises, poor lighting, squeaky doors/hinges and an outdated kitchen. As a Katy homeowner, it’s up to you to determine which of these features you have, and which need to be upgraded most! Have questions? Need a second opinion? Ready to sell your Katy home? I am a Katy real estate agent, standing by, ready to help you with all of your real estate needs in the coming year. Don’t hesitate to contact me! I wish you all a wonderful holiday and a happy new year! Are you gearing up to sell your Katy home soon? You can do it this holiday season! This KCM Crew points out five reasons why the holiday season is actually an excellent time to sell. As your Katy real estate agent, I am here and ready to help you, no matter when you choose to sell. Just give me a call and we’ll get started! Even if you choose to wait until after the holidays, you can still begin to prep your Katy home for a sale, and to properly stage it. If you watch HGTV’s ‘Fixer Upper’ then you will be excited to know that Joanna Gaines has published her first book. She’s also shared some home-staging tips she’s come up with over the years while working in home improvement. Don’t include too much furniture. Often, homeowners will add furniture to a room, to show how much can fit and how many people can hang out there. However, too much furniture can make a room look smaller and cluttered. Joanna recommends no more than three large pieces in each room, to make a room feel more open. Clean up. This one is a given, but some home sellers still don’t do it! If you want Katy homebuyers to fall in love with your home, it has to be clean. A buyer won’t be able to look past the dirt to see the potential! Plus, they’ll see that you love and care for your house, and that could make them want it more. Don’t stuff clutter into closets. While cleaning, it’s tempting to throw all of your clutter into closets. After all, that’s what many of us do before a holiday gathering at our house! However, unlike holiday guests, buyers will definitely look in the closets to check for storage space. Declutter ahead of time, and get rid of anything you no longer need or use. In a pinch, opt for under the bed rather than in a closet. Remember your home’s exterior. As Katy homeowners, we spend most of our time inside the house, so sellers can sometimes forget to stage their exterior. But this is the first part of the house a buyer will see, and first impressions stick! Power-wash the driveway and siding, display a few potted plants by the front door, and consider updating the address numbers, mailbox, front door or any other outdated items. For more tips from Joanna of ‘Fixer Upper,’ check out this Realtor.com article. When you are ready to sell your Katy home, either this holiday season, or early next year, contact me! As a Katy real estate agent, I am ready to help you as soon as you are ready to sell. 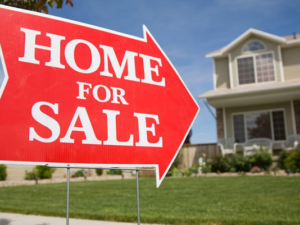 Are you ready to sell your Katy home? Take a moment to consider how much you know about the appraisal process. Many Katy home sellers fall for appraisal myths that are not accurate. An appraisal can help you understand why your house should be listed for more or less than the similar home down the street, or why an upgrade you made might not add value to your home. As your Katy real estate agent, I’d like to clear up some of these myths for you! Understanding the appraisal process will bring you one step closer to understanding the home-selling process as a whole, so you can go into it with confidence and knowledge. Myth #1: I don’t need an appraisal because I had a home inspection. Truth: There are many differences between the two. An inspection is not required. An appraisal often is required if there is financing involved. Plus, they investigate different subjects. Investors determine the condition of the property. An appraiser determines the value of the property. Myth #2: All appraisers are the same. Truth: Just like with all people involved in real estate transactions, no two people are the same. One Katy real estate agent may be very different and differently qualified than other. One appraiser might have better experience, expertise and certifications than another. As an agent, I can recommend appraisers in the area who have valued properties similar to yours and have excellent experience. Myth #3: Every home improvement adds value to my home. Truth: Home improvement projects rarely provide a dollar-for-dollar return when you go to sell your Katy home. Renovations are not all created equal, either. Some are known for having higher return on investment values than others. Some even lower your value and are seen as excessive, especially if they aren’t in line with what’s expected in the community that the home resides in. Myth #4: There isn’t anything you can do about a low appraisal. Truth: While appraisers are expected to provide credible and reliable opinions, mistakes can happen. You should review the appraisal report to ensure that all the information about your property is accurate. If you find any errors, you should tell your lender immediately and request a new appraisal. An appraisal is considered a credible and reliable opinion of value, which is derived from experienced professionals who look at the current market and a detailed analysis of the property. The more you know about the process beforehand, the fewer surprises you’ll experience during the process. Have questions? Ready to sell your Katy home? Either way, contact me, your Katy real estate agent! I am always ready to help you in any way that I can, to ensure a smooth and satisfying home-selling process. If you’re ready to sell your Katy home, you might wonder if you should use an agent or not. You might be reading reports about how it’s a seller’s market, with inventory low, buyer demand high and home prices/sales rising. You might decide that means you can save the money on using an agent, and just sell your Katy home on your own. As a Katy real estate agent, I am here to tell you why that might not be the wisest decision. 1. When you work with an agent, the exposure your listing has to prospective buyers grows by a vast amount. Studies have shown that 88 percent of buyers search online, so rarely does a yard sign or ad in the paper get the job done anymore. Even if you do put a listing up online in your own way, not nearly as many buyers will see it as when you work with an agent. We know exactly where to put it to ensure the most views! After all, we’ve been doing this for a long time. 2. You see results from the internet. Studies show where recent buyers actually found the home that they ended up purchasing. Of those buyers, 44 percent found it on the internet, 33 percent from a real estate agent, 9 percent from a yard sign and 1 percent from the newspaper. The numbers don’t lie! The best way to sell your Katy home is with a professional listing on the internet, and with a Katy real estate agent who has experience and a strategy ready to go. 3. The average person doesn’t have negotiating skills like an agent does. Most Katy home sellers don’t realize how many people they’ll have to negotiate with during the home-selling process! You’ll negotiate with a buyer who wants the best deal possible, the buyer’s agent who has lots of experience with this and who solely represents the buyer’s interests. Then there are attorneys, home inspectors, appraisers and more. Agents are professionals at negotiating! We do it all the time. 4. Paperwork has made it hard for FSBOing. 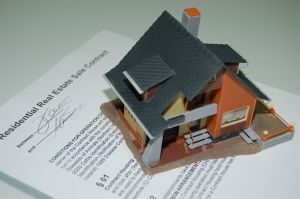 First of all, the paperwork involved in selling a home has increased significantly over the years. There are tons of disclosures and regulations that you have to follow, which can become quite stressful, and prolong the process, if you don’t know what you’re doing. This might be why FSBOing has dropped from 19 to 8 percent over the last 20 years. 5. You net more when you use an agent! This is the most important reason of all. The whole point of you not working with an agent is to save money, but you make up for that in the price of the home! Studies have shown that the typical house sold FSBO sells for $210,000, while the typical home sold by an agent is $249,000. Also, the seller and buyer can’t both save the on real estate commission, so you may not even save in the long run. As a Katy real estate agent, I know where to list your home so that potential buyers see it. I have the technology for professional photos for your listing. I know how to negotiate. When you work with me, you might sell your Katy home for more than you would on your own, and faster! Are you convinced? Have questions, or are you ready to sell? Either way, contact me! I am ready to help you. Are you ready to sell your Katy home this fall? 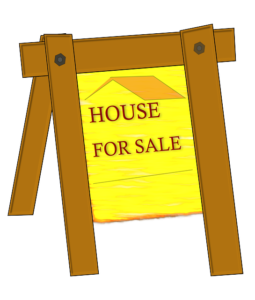 As a Katy home seller, you will need to prepare your home for a sale. This means you need to declutter, depersonalize, deep clean and stage your home to sell. As your Katy real estate agent, I can help you through each of these processes if need be! Once your home is clean, staged and ready to go, you will need to maintain that cleanliness for weeks, or months, for showings and open houses. As a homeowner, I’m sure you can guess that it’s easier said than done! That is especially true if you have kids or pets, or just a very busy schedule. 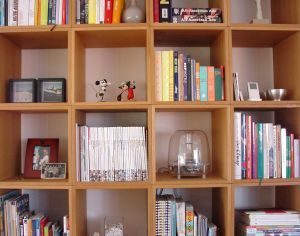 To help you out, I’m going to share tips on what you can focus on when you have little time to clean and prepare your Katy home for a showing. Do you only have two hours? One hour? Half an hour? You can still make your home look presentable! Just follow these tips. Tidy up common areas, such as folding throw blankets, fluffing pillows, stacking magazines and throwing loose papers in a drawer. Have a place to store clutter ahead of time, so you can throw it in there momentarily! Wipe down sinks and countertops in the kitchen and in bathrooms. Move dishes into the dishwasher. Empty garbage bins and take out the trash. Vacuum the carpets and sweep the floors. Clean the toilets and tidy up the bathrooms in any other way that you can. Clear and dust all surfaces. If you notice any odors in the home, consider lighting a scented candle. 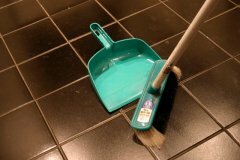 Mop the floors and wipe down the baseboards. Clean out the fridge and microwave. Tidy the entryway closet and bedroom closets. Wipe down all of the mirrors. These tips came from a My Domaine blog post and are a great way to keep track of the cleaning tasks that need to be completed before a home showing! 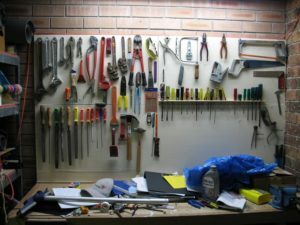 Now, if one area of your house needs more work than another, by all means, switch up the order of importance of these tasks. Create your own task lists with the amount of time you have. Just have a plan in order, so that when it comes time to clean and then head out of your home, you’re ready. Keep in mind that these tips work great when you’re expecting company too! As a Katy homeowner, it’s always a good idea to have a house-cleaning plan in the works. Ready to sell your Katy home? Contact me, your Katy real estate agent, and we can get you started with the home-selling process this fall!